Ankita Raina and Karman Kaur Thandi won their doubles match to help India beat Thailand 2-1 in the Fed Cup Asia-Oceania Group - 1 tournament in Astana. India staved off an unexpected scare from lower-ranked Thailand as Ankita Raina won both singles and doubles matches to lead the side to a 2-1 win. India's Ankita Raina and Karman Kaur Thandi's brilliant effort towards the end marked off a win for India in their Fed-Cup opener. 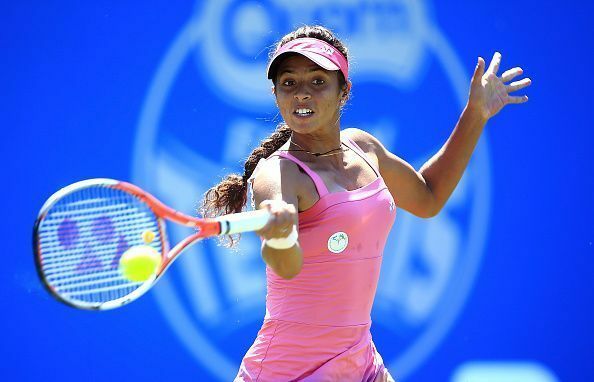 India were 0-1 down after Thandi lost her singles match to Nudnida Luangnam 2-6, 6-3, 3-6. Thandi’s loss would have shocked the Indian team as her opponent was ranked 500 places below the Indian. However, Raina’s fighting 6-7(3), 6-2, 6-4 win over Peangtarn Plipuech kept India alive in the tie. After losing a nervous tiebreaker, she regained her poise to thump Plipuech in the second and third sets. With scores 1-1, the doubles became the decisive rubber and captain Vishal Uppal fielded both the singles players. Then, she combined with Thandi to clinch the tiebreaker. The Indian pair missed two match points at 6-4 in the second set tie-break, after it had trailed 1-5 in that set. But Raina and Thandi bounced back from 3-5 in the decider, winning the last two games at love to seal the victory. “I know my opponent was tricky. I have beaten her and lost to her as well. More than my opponent I had to fight mentally the cold which I don’t like, and I am really happy I have passed my own test," Raina said after the match. Uppal emphasised on how India didn’t play to its potential but showed great fightback to clinch the humbdinger. “Thailand played exceptionally well today but we dug deep to beat them. Our lapse in concentration made our task tougher for us,” in an interview to PTI after the match," Uppal added. India will next play hosts Kazakhstan on Friday.